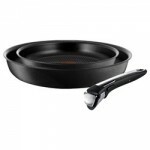 Do you need a JML Ninja Master? You are here: Home / House + Home / Do you need a JML Ninja Master? JML is always tempting me with its in-store infomercials that promise to make me and my life more wonderful. 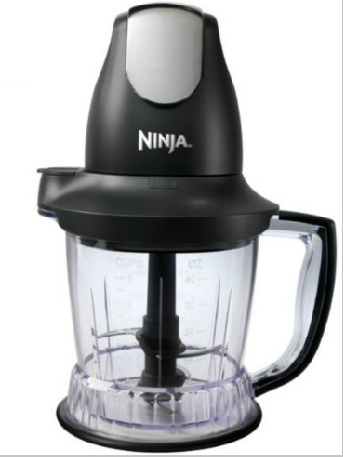 The JML Ninja Master (£39.99) is the latest life-aid that will apparently allow me to reduce kitchen clutter, make the “smoothiest smoothies” and go from “fridge to table top with ease”. I’m not sure I fully understand all that, but the man in the video sounds so excited I’m already on board anyway. I’ve had a week with the Ninja Master Prep Advantage, which is the simpler version of the Ninja. 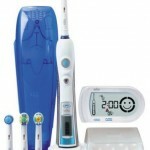 It comes with just one blade and jug size (while the Advantage model includes a larger blade and two other jug sizes). 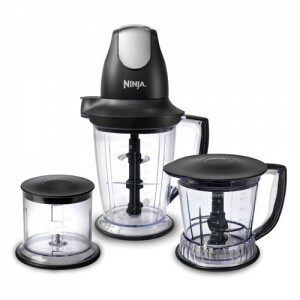 Unlike most food processors, the Ninja Master has the motor on top so you have to lift it onto the jug, rather than placing the jug onto a base. This mean you end up with a motor that you need to pick up and down, but it does also make it slightly more compact than the usual desktop food processors. The large silver button on top of the motor is what stirs the blades into action. The idea is you hold the button down for different lengths of time depending on the type of cut you want to achieve. If you’re chopping onions and other veg, you give it short bursts, while if you’re blending a smoothie, you can hold it down for longer to create a totally pulped finish. It’s incredibly simple to use. You chuck in the veg or meat you want to prepare, put the motor on top and press the button. It’s also easy to clean, with a dishwasher-safe jug. For simple food prep, it really is more useful than a hand-held blender or a simple food processor. We use our hand-held whisk a lot to blend plum tomatoes, make whipped cream, and blend up soups or baby food. But the larger jug plus the additional chopping options makes this a more versatile solution. Where it can’t compete, however, is with the larger food processors that come with a variety of attachments for grating, slicing, whisking and chopping. I found it hard to get the larger chunks of food you can see in the marketing images. It was great for finely chopping onions, but chunkier pieces eluded me. Maybe it requires more practice? 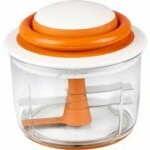 Even so, there is no grating or slicing attachment, so don’t expect it to totally supersede your food processor. But since my food processor lives in a box in the top cupboard, I hardly ever use it. The JML Ninja Master Prep Advantage is small enough to exist quietly on my kitchen worktop when it’s not in use, and would also fit into a cupboard without too much fuss. This means I’ve already used it for preparing vegetables when I would previously have just used a knife, saving me time and significantly reducing the number of times I slice off a piece of finger in a week. I also used it to create bread crumbs and blend sauces. Where I can get really excited about the Prep Advantage is in creating baby food for weaning. It’s easy to blend up veg, and the lidded jug means you can store it straight in the fridge, allowing me to go “from fridge to table top with ease”. I think it also makes being adventurous easier. I can see myself making hummus, breadcrumbs and small amounts of this and that when I might not previously have bothered. Aside from the quibbles on the weight of the motor, the inability to do chunky veg chopping, my only other minor complaint would be the design and plastic finish. It’s certainly not going to compete with something created by Cuisinart or KitchenAid when it comes to looks. But that’s reflected in the price.